TerraClean can simply be described as an engine decarbonising system. TerraClean is designed to remove carbon build up and lacquers found inside an internal combustion engine and fuel system. By removing carbon and lacquer build up the TerraClean service will help to restore lost performance and efficiency while also reducing emissions. 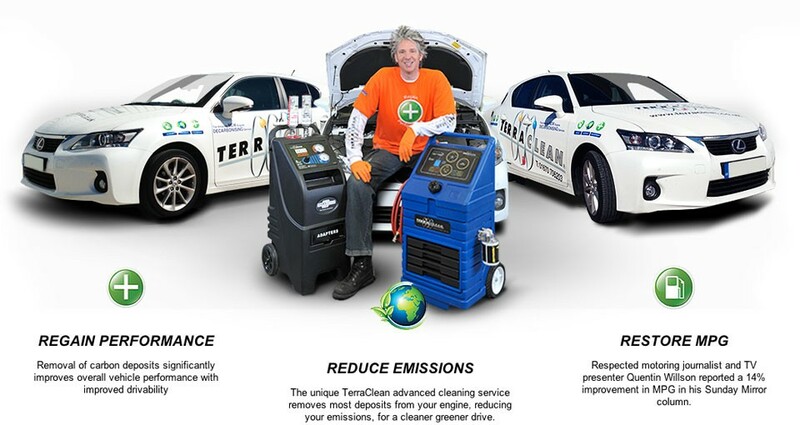 TerraClean was born after scientists in Canada were tasked by the Canadian government to engineer a zero emission fuel. The scientists achieved their goal, but the fuel and system was uneconomically viable for everyday use. However, all was not lost, the scientists reported something quite unique during their investigation, the fuel system they invented not only generated zero carbon, it also removed existing carbon, pre and post combustion. After this discovery the TerraClean decarbonising system was born. Utilising the technology the Canadian scientists had developed, TerraClean is now applied worldwide as a decarbonising service for internal combustion engines. Terraclean is widely used throughout all industrial sectors: Automotive, Motorcycle, HGV, Agricultural, Marine and Heavy Industrial. There is currently over 13,000 TerraClean machines in North America and over 450 service centres in the UK and Ireland. The UK dealer network is growing on a daily basis and we are a proud to be a part of the TerraClean team. The TerraClean service is not just a fancy injector cleaner, it is much more than that, before the highly refined fuel enters the engine the fuel is negatively charged (petrol system), this causes the positively charged carbon inside the engine and fuel system to be attracted to the fuel and the carbon is then burnt inside the combustion chamber. No harsh additives are used, is it simply advanced chemistry which is safe for all engines. Furthermore, the TerraClean service is unique because it offers pre and post combustion cleaning, most cleaning systems on the market today are only designed to clean pre combustion, i.e. fuel lines, injector internals etc. TerraClean on the other hand will also clean post combustion, i.e. piston rings, combustion chambers, injector nozzles, exhaust valves, EGR valves, DPF’s, catalyst converters, lambda sensors, etc. For direct injection engines we also have a TerraClean inlet cleaning tool. During the TerraClean service specialist equipment is connected to the engine and the vehicle fuel tank is disconnected. The TerraClean equipment will go through several different cleaning cycles while the engine is running. The whole process normally takes approx 45 mins to complete. TerraClean was the first and is the most established brand in the ever growing engine decarbonising industry. We do not offer the cheapest decarbonising service…. but we do offer the best.